Choose from an extensive list of special materials and finishes to meet environmental and wear requirements. Finishes for jacks and housings. 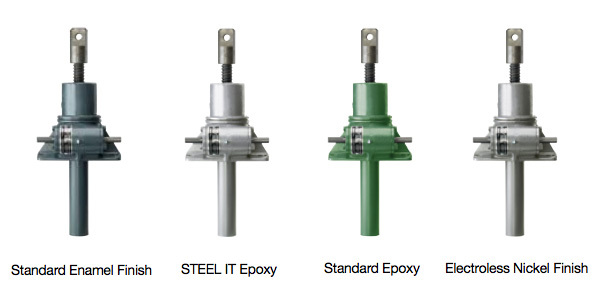 Gray enamel: the standard finish for Joyce jacks (2-ton and larger) and electric cylinders. Miniature jacks with aluminum housings (WJ250, WJ500, WJ1000, WJ51, WJ201, WBL51, WBL 201 & WB201), linear actuators, and integrated actuators are unpainted. Standard epoxy (F2): comprised of a two-component polyamide primer, and a two-component, low VOC, polyurethane topcoat (available in green and white). STEEL IT® epoxy finish provides a hard, non-toxic finish. It is comprised of a two-part, lead-free epoxy primer with a two-part a two-part polyamide epoxy topcoat (which incorporates 316 stainless steel leafing pigment). Approved by USDA for use where incidental food contact may occur. Joyce Outdoor Paint Process (F3), an exclusive paint process that protects against corrosion due to harsh outdoor environments. It incorporates rigorous surface preparation with a premium epoxy primer and topcoat and stainless steel hardware resulting in a durable, corrosion-resistant finish that is in high demand on antenna jacks, solar actuators, mining industry jacks and jacks used in coastal installations. Clear coat anodizing is a uniform coating process that increases the corrosion resistance and wear properties of aluminum housings. It will not flake or peel. Electroless nickel plating is a thin, uniform coating. When applied to jack housings, it provides superior corrosion resistance and improved wear resistance, while having little effect on the fit of mating components. Materials and finishes for lifting screws. Stainless steel lifting screws: standard onWJ250, WJ500, WJ1000 and for all stainless steel jacks. They are available for machine screw jacks, bevel gear jacks, metric jack, and traveling nut (TN) style integrated actuators. Armoloy®,a thin, dense chrome finish intended to increase wear and corrosion resistance, and improves lubricity. It can also be applied to stainless steel components for superior corrosion resistance. This thin coating (0.001" - 0.003") has little effect on the fit of mating components. Xylan® coating which uses a combination of fluoropolymer lubricants and resin binders, significantly reduces the coefficient of friction of components and offers excellent corrosion protection and good chemical resistance. The application of this coating (0.0002" - 0.0007") has little effect on the fit of mating parts. Finishes and materials for input shafts, clevis ends, and other components. Stainless steel worm shafts which are standard on WJ250, WJ500, WJ1000, and all stainless steel jacks, are available as an option on most wormgear style jacks. Armoloy®, a thin, dense chrome finish, intended to increase wear and corrosion resistance, and improves lubricity. It can also be applied to stainless steel components for superior corrosion resistance. This thin coating (0.0001" - 0.0003") has little effect on the fit of mating components. Electroless nickel plating is a thin, uniform coating. When applied to worm and pinion input shafts, it provides superior corrosion resistance and improved wear resistance, while having little effect on the fit of mating components. Zinc coating: provides protection against corrosion, increases surface libricity, and improves the aesthetic appearance of components. The effect it has on the fit of mating components is dependent on the thickness of its application (0.002" - 0.010"). Since finishes are applied directly to jacks and actuators and special materials are used in their construction, they are specified as part of the suffix of the complete part number. Contact Joyce/Dayton and allow our Application Engineers to assist in your choice of special finishes and materials.